Volunteers manage the compost piles with Solana Center's Senior Environmental Educator & Fair Liaison Jennifer Galey. 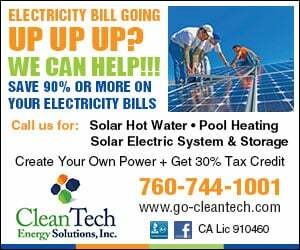 Photo courtesy of Solana Center for Environmental Innovation. ENCINITAS — Something’s cooking at Solana Center for Environmental Innovation, but it’s not what you might expect. As organic matter decays, it heats up. A compost pile is considered “hot” because it can reach internal temperatures of 160°F (140°F is ideal). Seeing a steaming compost pile at Solana Center’s headquarters in Encinitas is witnessing active microbial decomposition at its finest. Countywide, San Diego sends more than 1 million tons of organic waste to the landfill each year — that’s 39 percent of San Diego’s landfill composition. Organic waste in a landfill decomposes without oxygen (anaerobically) and releases harmful methane and other greenhouse gases into the atmosphere. Composting is an easy way to recycle organic material into a nutrient-rich and water-saving soil amendment for gardens and landscapes. However, not everyone is able to compost at home. For those who feel a twinge of guilt every time they throw out kitchen scraps or leftovers, there’s Solana Center’s Community Compost Program. Bokashi bran being added to a bucket containing food scraps. Photo by Jamie Higgins. For a nominal fee, participants bring their food scraps to Solana Center and, with the help of volunteers, staff process the organic material on-site. The resulting compost is made available to program participants. The Community Compost program is able to accept all food scraps including meats, dairy, and oils because they use the bokashi method. Bokashi is a Japanese term for “fermented organic matter.” It is an anaerobic pre-composting process using effective microorganisms, inoculated bran, rice, or straw to ferment organic waste in a sealed container. Bokashi was developed in Japan and used in Asia to ferment food prior to composting. The process uses lactobacillus bacteria to predigest waste matter, which eliminates odors and decreases composting time. Compared to traditional composting, bokashi fermentation offers many benefits. It produces an end product that is richer in organic matter and nutrients, allows you to compost any organic material easily, does not require turning like you would a traditional compost pile, captures all nutrients/by-products in a sealed container, minimizes worry about insects or rodents, can be done on a small scale (e.g., in an apartment), and enables you to keep food scrap in an airtight container until you are ready to drop it off to Solana Center. 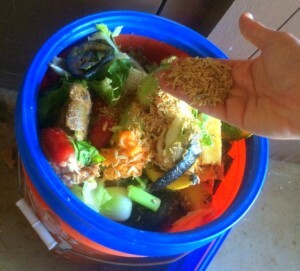 Once participants learn how simple the bokashi method is, they sometimes opt to start composting at home. “People learn about bokashi and say, ‘I can do this myself,’” said Lisa Fabula, Solana Center’s zero waste coordinator. The organization, formerly known as Solana Recyclers, is again on the forefront of one of the region’s most pressing environmental issues — organic waste diversion. Back in 1983, Solana Recyclers’ recycling trucks could be seen picking up the green and yellow recycling buckets that were distributed to households in Encinitas, Solana Beach, and Del Mar. The organization is proud to have pioneered the first comprehensive curbside recycling program in San Diego — and one of the first such programs in the state. Thirty-five years later, they’re still providing local solutions for the San Diego region. Now known as Solana Center for Environmental Innovation, the organization advises and educates residents, schools, businesses and local governments throughout San Diego County how to reduce waste, conserve water and build healthy soil. It provided consulting services to Kashi, when the company wanted to set up an on-site composting system at its Solana Beach location. Kashi employees are currently composting 160 gallons a month. It has also collaborated with Dr. Bronner’s, the environmentally conscious soap company, to help it try different compostable food “to-go” containers. The work that Solana Center does with businesses like Dr. Bronner’s and Kashi represents some of its most cutting-edge environmental innovations, something the staff is excited to share with organizations that want to improve their environmental footprint. Down the freeway at the Del Mar Fairgrounds’ Infield Farm, Solana Center has developed the Eco Learning Lab Composting Demo Center, designed to provide on-site composting options for food businesses, company cafeterias, farms, ranches, schools, churches, HOAs and community gardens. The Eco Learning Lab Compost Demo Center is the region’s only mid-scale composting training site. 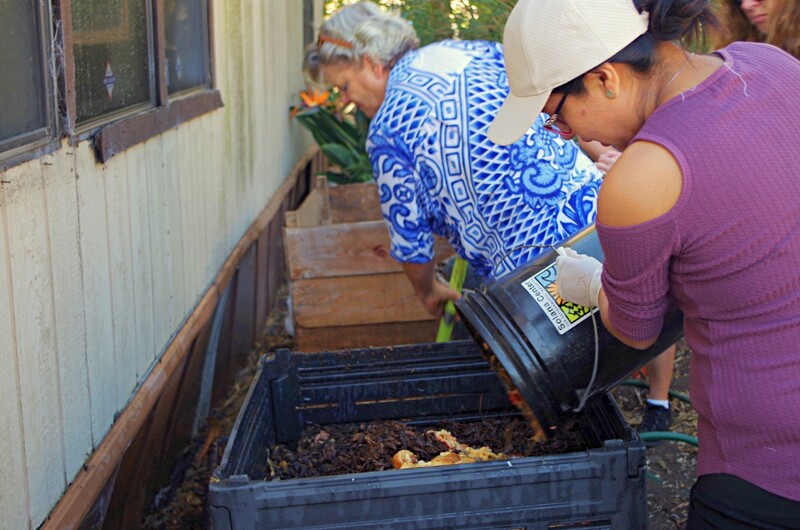 Solana Center is offering a free Composting for Farms, Schools, and Community Gardens Workshop Series at the Eco Learning Lab, starting on March 24. Mid-scale composting is a great option for farms, schools and businesses with organic material that needs disposal, and it can reduce costly solid waste service. The workshop series is funded by the county of San Diego and unincorporated county of San Diego residents receive preferential registration. For information about Solana Center’s Community Composting Program, Consulting Services or the Composting for Farms, Schools, and Community Gardens Workshop Series, visit www.solanacenter.org, or call (760) 436-7986, ext. 700 or email info@solanacenter.org. North County’s hidden gems offer off-the-beaten path décor.